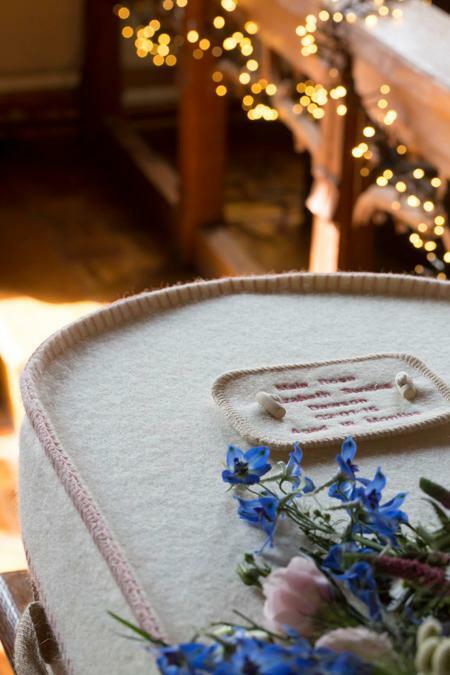 Using new pure wool these lovely coffins are handmade in Yorkshire by Hainsworths. All the materials used in the woollen coffin are readily biodegradable and suitable for cremation and all types of burial. Unfortunately we can’t sell an individual wool coffin with delivery as we can with willow coffins as they’re unsuitable for our courier. We can however provide one if you are a family making funeral arrangements with us in the North West. The wool coffins are strengthened with a sturdy recycled cardboard liner. The interior of the coffin is lined with organic cotton and attractively edged with jute and has a biodegradable waterproof base. The coffin is completed with a personalised embroidered woollen name plate. We can either have it embroidered for you or we can give you the nameplate to embroider or felt yourself.